Hold the phone and shut the front door! The U.S. Men’s and Women’s National Soccer Teams celebrated LGBTQ Pride last month with their fabulous rainbow-numbered jerseys! 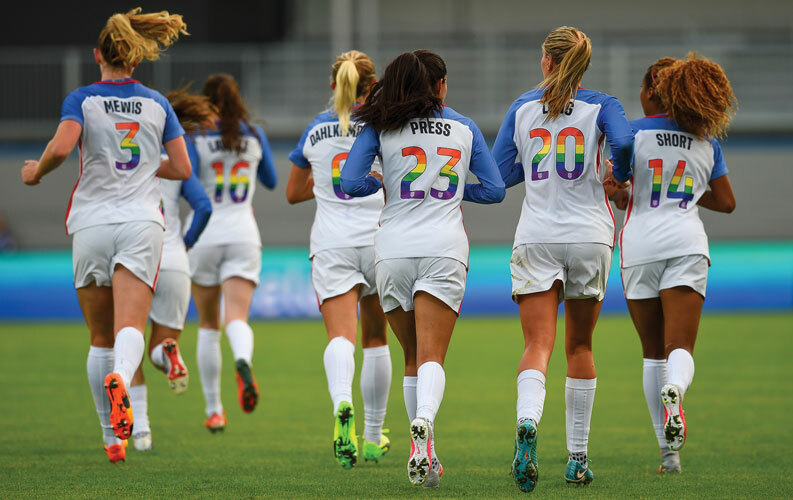 Done in partnership with the You Can Play Project, U.S. Soccer along with the U.S. National Soccer Team Players Association and the Women’s National Team Players Association, the rainbow-numbered jerseys were part of several initiatives activated by the group during June to recognize LGBTQ Pride month. It also included filming a public service video featuring members of both senior National Teams expressing acceptance and inclusion for and of athletes from all backgrounds. One set of game-issued jerseys from each team were available in an online charity auction following the games but fans can still purchase limited edition customized men’s and women’s jerseys with the rainbow numbers via ussoccerstore.com. A special “One Nation. One Team” hat with rainbow lettering is also available for purchase and monies from all three items are being donated to the You Can Play Project which is dedicated to ensuring equality, respect and safety for all athletes, coaches and fans without regard for sexual orientation and/or gender identity. Both the men’s and women’s National Teams donned their gay apparel during last month’s June friendlies. The men’s team took on Venezuela with the home field advantage and tied while the women’s team took on both Sweden and Norway to come home with two wins. This is the first time a U.S. National Team has made an official demonstration in support of the LGBTQ community. While many individual athletes in the past have made smaller shows of support, including Men’s National Team (MNT) captain Michael Bradley who wore a special rainbow armband bearing a #OneNation hashtag in support of the victims of Pulse massacre in Orlando, this is the first time an entire team has shown its Pride. This show of support from U.S. Soccer will contribute to FIFA’s (soccer’s governing body) ongoing effort to combat homophobic, racist and discriminatory remarks and chants that are still quite prevalent around the world by soccer players and coaches but even more so by the fans. Most recently the Atlanta United Major League Soccer (MLS) team had to contend with fans using a chant involving a gay slur to distract the opposing team’s goalie. Over the last few years FIFA has used fines to try and stop the homophobic chants by fining teams from Argentina, Brazil and Mexico for their fans chanting at qualifying matches for the 2018 World Cup. Unfortunately, the fines have made little-to-no impact; Mexico has already been fined eight times with no positive change. So this month FIFA has added a new, more severe punishment for discriminatory behavior. Prior to the start of a match, a video will be played on the big screens of FIFA Confederations Cup stadiums sharing an anti-discrimination message. If that is ignored, referees now have the authority to pause a match and make a loud speaker announcement warning fans to stop using discriminatory language. And if it still doesn’t stop, they can suspend or even end the match. FIFA will also place anti-discrimination observers at all matches of the FIFA Confederations Cup 2017. For its part, Atlanta United has publicly stated that it does not condone homophobic chanting and has been working to discourage the use of it. Team representatives told Outsports, “We are working directly with supporters to educate them on our views and to develop alternative chants.” They also stated that fans using any inappropriate chants will be ejected from the facility. In a group environment it is easy to challenge the strength and confidence of an opposing team and individual players by using discriminatory words and actions. Behavioral science suggests that many sports fans strongly identify with their favorite sports teams. Since sports have the power to bring out a person’s true identity and character, that may also include internalized homophobia. While a person may not consciously admit being homophobic, even protesting by using the standard adage, “I have gay friends,” actions speak louder than words. While slightly better than other national soccer leagues, the Atlanta United story reveals the U.S. teams are certainly not immune to instances of overt homophobia. There was some minor controversy regarding the U.S National Soccer teams and the rainbow jerseys. One player with a history of being an anti-gay, conservative Christian chose not to take part in the matches where the rainbow jerseys were being worn. An announcement was made that the athlete in question was absent from play, citing “personal reasons” without mentioning the rainbow jerseys. With displays of homophobia now so well covered by the media, it brings this issue to the forefront and challenges professional sports organizations to take an active role in standing up to this discrimination. There is still a lot to tackle (pun intended) in terms of homophobia in sports and even more regarding transphobia in sports. However, with similar efforts such as NHL’s partnership with You Can Play, the creation of dozens of You Can Play videos featuring NHL teams, MLB sponsoring “Pride Nights” throughout the year and the recent announcement of the New England Patriots becoming an official sponsor for the 2017 Gay Bowl, many of the stigmas and stereotypes associated with being a gay athlete are being dispelled. While there may never be a “gay” Jackie Robinson to finally erase the erroneous assumptions about LGBTQ athletes, the continuing contributions of each individual team and league are helping to build the awareness of the LGBTQ community and its presence in our everyday lives. It will do much to break down traditional sports-related masculine and feminine stereotypes. Hopefully, the byproduct of that will be the empowerment of current and future LGBTQ athletes to feel accepted by their peer athletes and to feel comfortable and safe so they can come out on their own terms while they are still active in the sport(s) they love.